I've been growing gesneriads for a few years now, and I feel like the next step in growing plants is having those plants make babies. I've collected selfed seed from Primulina tamiana and Sinningia pusilla, but I had never intentionally pollinated my plants to make interesting crosses. Recently, my Sinningia reitzii and S. defoliata were both in bloom--I thought why not try to cross them? After that recent disappointment, a thread on the Gesneriphiles mailing list gave me a few pointers, provided by hybridizer Dale Martens. First go to the internet and take a look at parts of a flower so you can learn the terms: pistil, stigma, style, ovary, stamen, anthers, pollen. No need to isolate a flower that you want to use as a seed parent. The tricky part is to remove that flower's pollen-producing anthers so it does not pollinate itself. For a Sinningia, the female part is the pistil (ovary, style, stigma) and it is not usually at its full length or readiness when the flower first opens. You need to study stigmas of Sinningia flowers that just opened and compare them to flowers that have been open for at least three to five days. Miniature Sinningia have very obvious differences between a stigma of a just-opened flower and one that's from a flower that has been open for five days. When the flower just opens, the stigma is small. When it's receptive, the surface appears almost fuzzy and an obvious opening in the center is seen. The anthers should be removed right away as soon as the flower opens, or even while it is in a bud stage if you want to be very careful. I do this by splitting/cutting the flower or bud open, then first hold onto the calyx end of the flower followed by using a finger and thumb to grasp the anthers and pull. Grasping the anthers helps to prevent them from scattering pollen in the air. Another way would be to split the flower open and then cut off the filaments that hold the anthers. 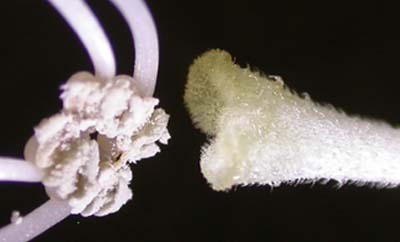 Jiggling anthers often causes pollen to spray. Rub pollen from another plant directly onto the stigma either by using a tweezer to hold the filaments behind the anther so a direct rubbing of pollen can be done... or use a fingernail or small artist's brush to remove pollen and transfer it onto the stigma. Take a look at the photo I attached. The pollen is on the left and is about to pollinate the stigma. Push/rub the pollen firmly onto the stigma. Pack it on. You'll see a pod develop within a week. Within 30 days (usually!) the miniature Sinningia pod will ripen by turning brown and splitting. Check each morning around day 27. Fold a piece of 2 inch by 2 inch paper in half and hold that under the pod while you cut off the pod with a small pair of scissors. That way you'll catch the seeds. You will need to identify who the pollen parents are. There are many methods. Mine is to put a dab of colored acrylic paint on the calyx of the mother and use that same color on a plastic plant label. I write the name of the pollen parent next to the dab of color and I write the date. If you go to a place like WalMart you can find in the craft aisle a plastic "string" of different acrylic paint colors for around $3. The hardest part of hybridizing is throwing away those that are not different enough from named Sinningia. Also be heartless when it comes to negative attributes like weak flower stems, brittle leaves, poor blossom count, and susceptibility to powdery mildew. I probably throw away 99.5% of my seedlings. I certainly welcome more responses from others who hybridize. My S. defoliata and S. reitzii aren't mini Sinningia, like Dale was talking about, but the techniques are still applicable--and my plants are still flowering. So next time, I'll get the timing right and hopefully successfully cross these plants and others I have blooming!